Japanese cleaning consultant Marie Kondo takes tidying to a whole new level, promising that if you properly simplify and organize your home once, you ll never have to do it again. Most methods advocate a room-by-room or little-by-little approach, which doom you to pick away at your piles of stuff forever. The KonMari Method, with its revolutionary category-by-category system, leads to lasting results. In fact, none of Kondo s clients have lapsed (and she still has a three-month waiting list). 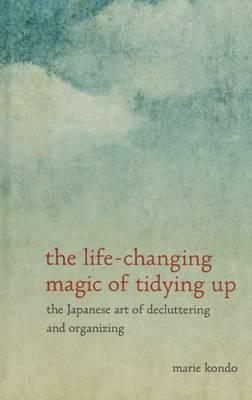 With detailed guidance for determining which items in your house spark joy (and which don t), this international bestseller featuring Tokyo s newest lifestyle phenomenon will help you clear your clutter and enjoy the unique magic of a tidy home and the calm, motivated mindset it can inspire." "Ms. Kondo delivers her tidy manifesto like a kind of Zen nanny, both hortatory and animistic." -- "The New York Times"
..".a literal how-to-heave-ho, and I recommend it for anyone who struggles with the material excess of living in a privileged society. (Thanks to Ms. Kondo, I kiss my old socks goodbye.) ... To show you how serious my respect for Ms. Kondo is: if I ever get a tattoo, it will say, Spark Joy!" -- Jamie Lee Curtis, "TIME "
..".her voice...is by turns stern and enchanted, like a fairy godmother for socks." -- "The Wall Street Journal"
"Reading it, you glimpse a glittering mental freedom from the unread/uncrafted/unworn, buyer s remorse, the nervous eyeing of real estate listings. Life s overwhelm, conquered."" -- The Atlantic"
.". ".a brief and bracing practical guide to tidying up your home." -- "Financial Times"
"[It is] enough to salute Kondo for her recognition of something quietly profound: that mess is often about unhappiness, and that the right kind of tidying can be a kind of psychotherapy for the home as well as for the people in it ...Its strength is its simplicity." --"The London Times""